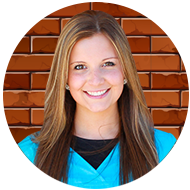 Nicole Althaus is a dental assistant at Langworthy Family Dental. After graduating high school from Wahlert in 2012, Nicole went onto NICC’s Dental Assisting program where she earned her certificate. Nicole joined the team in 2013, but has been part of the family since she was a child, as she has been a patient with Langworthy for most of her life! Nicole enjoys meeting new patients and seeing familiar faces, as well as working with children, and making patients as comfortable as possible. When not in the office, you can find Nicole spending time with family and friends, traveling, and being active outdoors. Nicole lives in Dubuque, IA with her dog, Teddy, a Shorkie.